The patient was a 68 year old man who was admitted to hospital for cardiac failure. He developed acute urinary retention and had to be catheterised. He died of complications of vascular insufficiency. 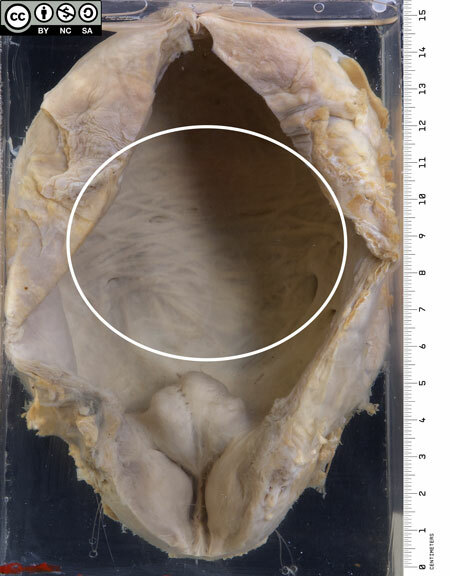 The bladder and prostate gland have been opened anteriorly. 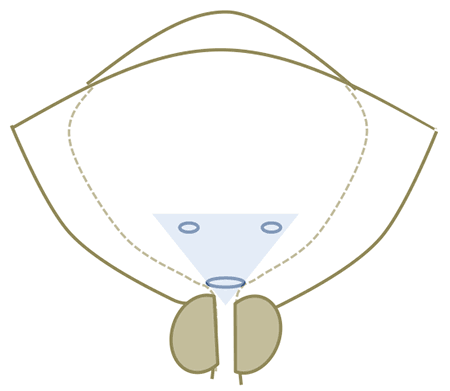 The median lobe of prostate is enlarged and nodular, and intrudes into the bladder floor. It obstructs the internal urethral opening, possibly with a ball-valve effect. This patient’s bladder shows some of the secondary effects of urinary outflow obstruction. Trabeculations (ridging) are due to hypertrophy of the detrusor muscle. The inner surface of a normal bladder is quite smooth. Permanent distension. The normal adult bladder is elastic with a capacity of 300 - 500ml. 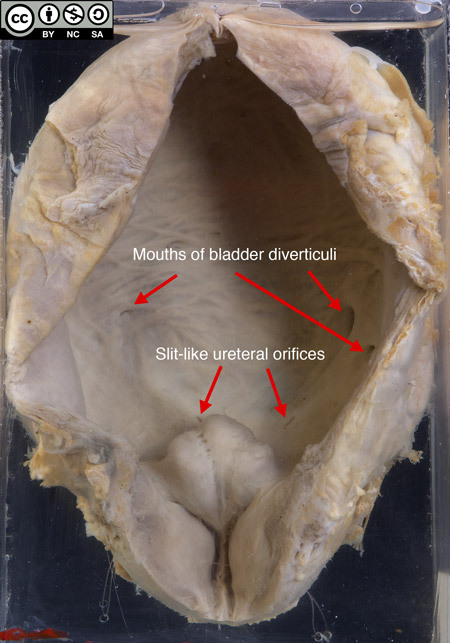 Diverticuli are outpouchings of the bladder wall. At autopsy the patient was also found to have bilateral hydroureter and hydronephrosis (not shown). 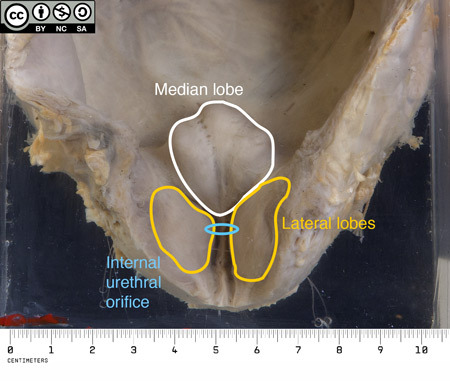 The trigone of the bladder is a triangular region of the inner bladder defined by the ureteral orifices and the internal urethral orifice. He died of a ruptured aortic aneurysm and the abnormal prostate was an incidental finding at autopsy. This is a transverse section through the prostate. What sort of organs tend to hypertrophy? What sort of organs lean to hyperplasia? Can you define hypoplasia or dysplasia or metaplasia, even aplasia? How would you explain to your patient with benign prostatic hyperplasia (BPH) what is happening in his prostate? The naked-eye appearance of benign prostatic hyperplasia was confirmed by microscopy. In addition, small foci of adenocarcinoma were seen. BPH is very common in men over 50 years. The finding of microscopic or latent prostatic carcinoma is very common in men over 70 years. The two conditions are independent i.e. BPH does not predispose to carcinoma. Benign hyperplasia involves both the glandular tissue and fibromuscular stroma of the prostate. It tends to occur in the central, peri-urethral region of the prostate. Prostate cancer is usually adenocarcinoma, deriving from glandular tissue. 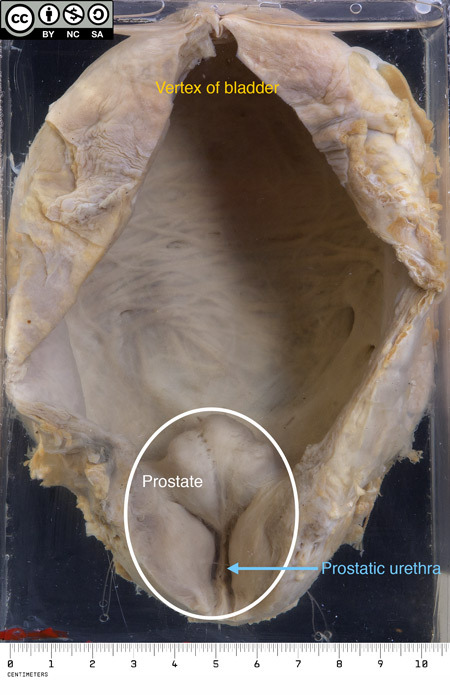 Most arise in the peripheral subcapsular region of the prostate, where the main glands are located.